* Are variations in the timing of pubertal development among girls related to their psychological and social life situation in the adolescent years? If so, when is the relation most prominent? In what areas is the relation most prominent? How does the relation come about? * Do interindividual differences in physical maturation have any long-term consequences for adult life? If so, in what areas, for which girls, and through which developmental processes does pubertal development operate? The long-term consequences are a major concern addressed in considerable detail. Contents: The Issue of Biological-Psychosocial Interaction. The General Approach and the Basic Model. Data. Psychological Adaptation and Self-Concept. Interpersonal Relations. Social and Emotional Adjustment. The Short-Term Consequences. Developing Girls in a Developing Environment. Mediators of the Influence of Pubertal Timing. The Long-Term Consequences. Some Final Reflections. "The use of a Swedish sample (N=466) is an important strength of the research....One of the most important results of this study is the mediating effect of peers on the results and the long-term consequences of pubertal timing." 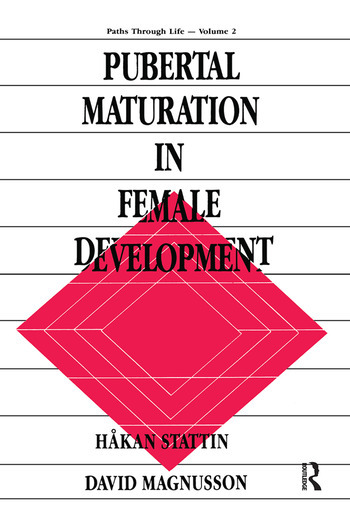 "...the research project from which this book is derived should be the standard citation for a data set exemplifying the developmental contextual view of human development. To the extent that this research is the exemplar of the importance of what may be a new theoretical paradigm -- not only for developmental psychology but for the study of human behavior in general -- then Magnusson's IDA project may be the single most important longitudinal study of this century." "...a path-breaking glimpse at the interaction of biological and psychosocial development across a 16-year period."